More of us are turning to audio books to inspire and educate and entertain us, whether we are visually impaired or just wish to listen while driving, jogging, walking or even swimming. This is why I am turning my first two books into audio books. Any support would be fantastic! DO YOU BELIEVE IN ANGELS? I invite you to participate in the creation of a feature film, whether financially or creatively. I believe in Angels and I believe in you! Together we can soar above the muck and the mire and see the world from a whole new perspective. Through the eyes of the Divine and with love and compassion. This film will be loosely based on my first book, The Magic Doorway into the Divine and the script might be a cross between Eat, Pray, Love and The Matrix! There are so many extremely talented individuals and artists who have dedicated their lives to honing their crafts and as a result, have accomplished so much in the world. I too have dedicated my life to the inspiration and upliftment of mankind and wish to take it to the next level, beyond just words...to the big screen. Won't you be my Angel? My life began as a dancer, model and aerobics pioneer, but my spirit and Soul had other ideas. At the age of 29, I had an enlightenment experience, which was soon followed by a miraculous healing. These two events put me on a completely different course that led me to devoting my life, energy and resources to deepening and integrating these and numerous other such experiences and ultimately to leading my life as one of service to anyone who is disillusioned, fed up, feeling lost and living their lives aimlessly pursuing temporary satisfaction from material or worldly things. So many people feel they are unaware of their true purpose, have no idea who they really are, (beyond concepts and personalities) nor do they know what life really is all about. So I’ve dedicated my life, the past thirty-five years studying with many true Gurus, Mystics and masters both ancient and current. While I encourage people to study with such saint-like individuals, not everyone is open to these types of Masters. In realizing this, I have shared all that I have directly experienced and all that I have learned from these great and timeless beings, freely and openly, hoping to be able to touch those who perhaps prefer, or are more open to, a more contemporary individual who hails from the West. Since my work is freely given, regardless of whether or not someone can pay or donate for the exchange, and in order for me to continue to mentor/coach, I am reaching out to you. I wish to create products and services that are designed specifically to act as a “life buoy” or as an inspiration or to be an ongoing educational support, for any and all who seek to open to and experience true love, purpose and who long to gain a true understanding of this crazy world and challenging times that we are living in and for those who seek to attain a profoundly deep peace that isn’t dependent on anything from the world but, can in turn, truly be a benefit to the world. I have been the host for my radio show, Living in Quantum Love on Dream Visions 7 Radio Network out of Boston, MA, where I interview enlightened guests who share their immense wisdom and even techniques that listeners can easily understand, digest and integrate into their everyday existence. All of my works, my two books, (both were international best-sellers on Amazon), Mystic Inspiration cards, numerous articles and even YouTube videos, translate lofty and complicated truths and spiritual concepts into more easily understood and relatable bite-sized pieces that can be absorbed, embraced and experienced. I have a children's book that I am beginning to do research on and have just completed my third. I'm excited at the prospect of turning my first book, The Magic Doorway into the Divine, into a screenplay and have just completed a ten page treatment. So all of this requires a means, financial support, (as well as finding the right people to pitch this to or finding those who can help move this project forward to the next phase). 40 credits – eBook of: The Magic Doorway into the Divine. 70 credits – eBook of: Leap to Freedom – Healing Quantum Guilt. 120 credits – A signed hardcopy of both books. 240 credits – Acknowledgement, (as sponsor) in forthcoming book & one physical deck of Mystic Inspiration Cards. 600 credits – “On Air” acknowledgement during a live broadcast on Dream Visions 7 Radio as a valued sponsor and two questions answered via email (is transferrable). 800 credits – One private phone session to address any issue that you might wish to gain clarity, direction or insight into, whether worldly or spiritual in nature. This is transferrable so anyone can be “gifted” with this. Based on the gifts outlined below and the amount of your offering, you will receive the equivalent in gifts. However, any amount in Crypto Currency is greatly appreciated! 30 credits and all of the above gifts plus an eBook of Leap to Freedom – Healing Quantum Guilt. 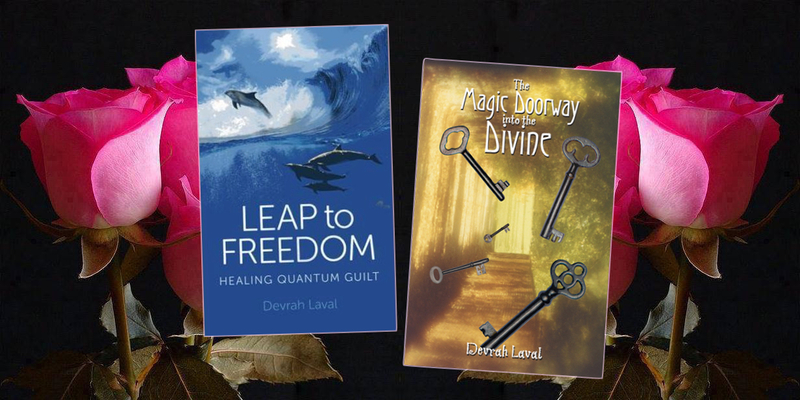 50 credits each month, all of the above gifts plus signed copies of both the, The Magic Doorway into the Divine and Leap to Freedom - Healing Quantum Guilt! 70 credits each month, all of above plus you will be acknowledged as a sponsor in Devrah's forthcoming book and one physical deck of Mystic Inspiration Cards. At $200/month, this will help to chip away at some of the many incidental costs such as editing services for my forthcoming book. A percentage of all donations to Devrah Laval will be given to those in need, whether from natural or man-made disasters.